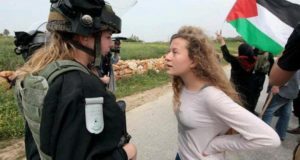 On Friday, 5 February, approximately 20 international and Israeli activists joined the residents of the village of An Nabi Saleh in the Ramallah district for the village’s regular non-violent demonstration against land confiscation and Israel’s occupation policies. The village had been placed under curfew since 7am, with all roads blocked by the Israeli military. 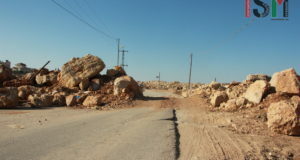 Prior to the start of the midday demonstration, the Israeli military invaded the village and attempted to prevent Israeli solidarity activists from being present in the village, forcing them to leave. Israeli and international activists, including three International Women’s Peace Service (IWPS) volunteers, however, we able to enter the village via the village fields joining internationals activists from the International Solidarity Movement already in the village. Within minutes of the non-violent demonstration commencing, the Israeli military open fired on the demonstration with tear gas. The Israeli military invasion of the village lasted for approximately 6 hours, with Israeli soldiers firing tear gas and rubber bullets at unarmed demonstrators, chasing demonstrators into and through the village fields. Two international activists were detained and assaulted by the Israeli military at approximately 2pm, including a volunteer from the IWPS. The volunteer reported that she was pushed violently to the muddy ground by a soldier, who then shouted at her. A male international with her was also assaulted and hand cuffed. Both international activists were detained for more than three hours in the permanent military tower located at the entrance of the village. They were released after three hours with no charges. In recent weeks, the Israeli military has stepped up its harassment of the village, conducting regular night raids and arresting village leaders and other village residents, including children. Currently a 14-year-old minor, who was arrested on January 23rd, is still in prison, no charges having been brought. Lawyers for the minor have reported that the child has been beaten. 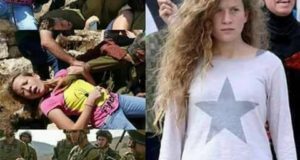 Another two children, including the 11-year-old brother of the 14-year-old were also kidnapped by the Israeli military and beaten. Village leaders have also been kidnapped by the military, held for several hours and beaten without any charges laid against them.